Lemon bars are definitely one of our favorite treats. It’s the perfect combination of sweet and tart. Meyer lemons are currently in season and we wanted to take full advantage of that. Meyer lemons are native to China and is thought be a cross between a lemon and a mandarin. The rind is beautiful, thin and a gorgeous shade of yellow. The flesh is a deep yellow with a hint of orange. The fruit is fragrant and is slightly less tart than a traditional lemon. Of course you can make these bars with regular lemons but Meyer lemons just make it a little more special. Prepare the crust: Cream butter and sugar until light in color in a electric mixer fitted with the paddle attachment. Add the lemon zest and mix. Combine the flour and salt. Turn the mixer to low and gradually add the flour mixture to the butter mixture. Mix until just combined, do not over mix. Place dough onto a well floured surface and shape into a ball. With floured hands, press the dough into a 9×13 pan. Chill the dough for about 15 to 20 mins. Bake the crust for about 15 to 20 mins, until the crust is just slightly browned. Cool on a wire rack. Filling: Whisk eggs, sugar, Meyer lemon zest, Meyer lemon juice and flour until combined. Pour filling over crust and bake for about 30 to 35 mins, until the filling is set. Cool on wire rack. Dust with powder sugar and serve. These meyer lemon bars are rich, luscious, and creamy. It's just the perfect balance of sweet and tart. This entry was posted in Desserts and tagged bars, dessert, lemons, meyer lemons. lemon bars are definitely one of my favorite treats, don’t you just love the color of meyer lemons? these photos are like sunshine, you can almost taste the tart! look so pretty! And they sound pretty simple to make. Chef Louise: I agree – meyer lemons are so vibrant! Erin: Thank you! I know your guest are going to enjoy them on Superbowl Sunday. I like to serve them chilled 🙂 You might have to make 2 batches! lemon bars and blah-lemon bars, but NOT THIS ONE-Thank you. YUMMY!! now, i feel compelled to make a batch this weekend. Jun: Thank you! 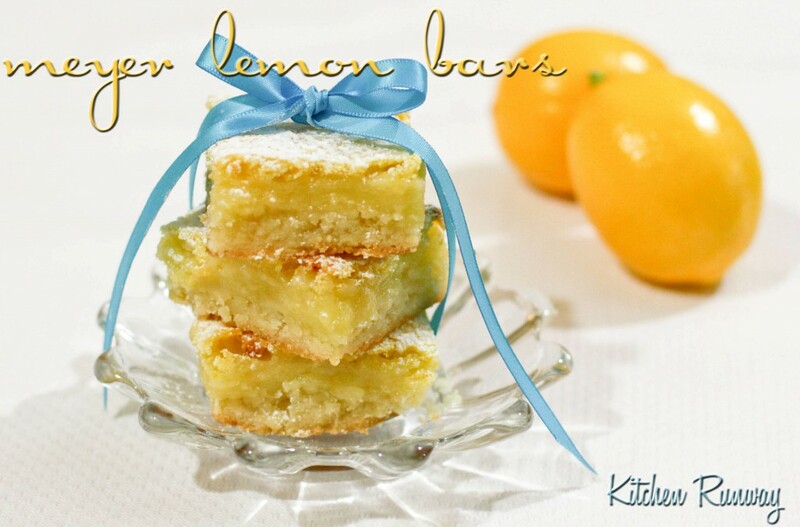 Your cousin will definitely enjoy these lemon bars – especially if she likes tart treats! Anna: Yay! Hope you get a chance to bake them soon! Amy: I’m so glad you enjoyed them and that you’re compelled to make a batch this weekend! The ingredients are definitely “buy-able”. Take care! Kim: You have such a green thumb! I’m so excited to try the Meyer Lemons from your tree! I already know what I’m going to make with them! yum! forward to making these. I really like your blog! 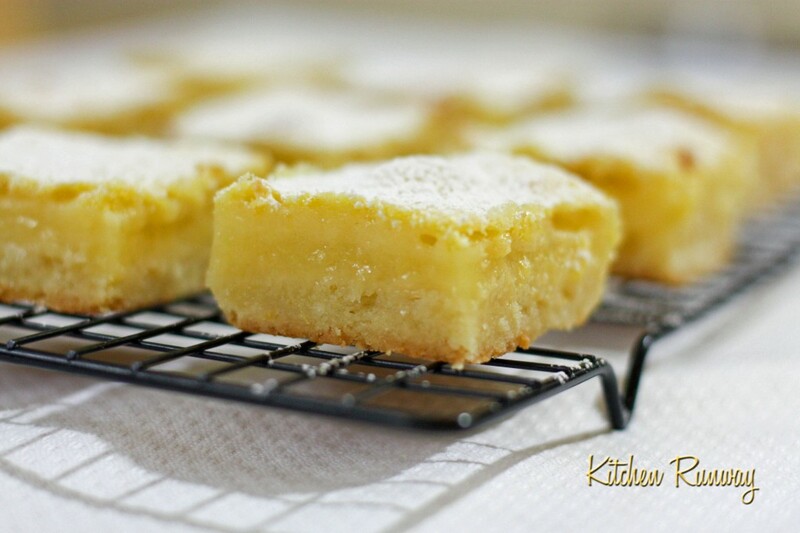 Lemon bars are my favorite and absolutely divine with Meyer Lemons! These look and sound delicious! Lemon bars are one of favs. Love that lead shot! Alicia: Thank you Alicia for stopping by! So glad you enjoy reading Kitchen Runway! Priscilla: Thank you! I’m looking forward to a post on your Meyer Lemon Martinis! Kesy: Thank you!! We’re going to have to get some Meyer lemons out to you! My mouth is puckering staring at these bars. The blue bow on the lemon bars look so adorbs! Is there a national lemon bar day? There should be one. Haha! Love these bars… looks mouthwatering. Kathy: Thank you!! I agree – there definitely should be a national lemon bar day! Food Librarian: You’re so lucky that you have direct access to a fresh supply of meyer lemons! Woothoo! You are turning me into a fan here, keep it up! Susan K: Glad you are putting those lemons to use and that you enjoyed the blueberry lemon crumb cake!! Wow – the power of the lemon bar!! I need to hone my bartering/negiotation skills — baking in lieu of cleaning the garage? That sounds like a win win situation!! Thank you and I’m so glad that you’re enjoying the blog & recipes! Take care!! 🙂 Hope to hear from you again soon! I made these last week and they got such rave reviews that I posted a blog about your recipe. They are DELICIOUS and now I really want to try more of your creations. Thanks! I made these about a month ago for my first taste of Meyer lemon and they were phenomenal! Even though they made so many, they went a lot quicker than they should’ve with only two people eating them :). Thanks for sharing! A definite go-to recipe from now in during Meyer lemon season! Paula Prass: Woothoo! Thank you for trying the recipe and thank you for sharing on your blog! Take care!! Alexandra M: Thank you for trying the recipe! I’m so glad that you enjoyed them! Yay for Meyer lemon season!